A new weather-tracking satellite has beamed back its first images of Earth from orbit, and the view is absolutely beautiful! The new satellite, called GOES-16, is the first of four cutting-edge weather satellites — collectively known as GOES-R — to be launched into space, and the 16th GOES (Geostationary Operational Environmental Satellite) mission in all. "This is such an exciting day for NOAA! 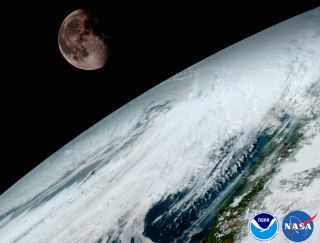 One of our GOES-16 scientists compared this to seeing a newborn baby's first pictures — it's that exciting for us," Stephen Volz, director of NOAA's Satellite and Information Service, said in a statement. The new photo collection includes an updated version of the iconic "Blue Marble" image of Earth as seen from space. "These images come from the most sophisticated technology ever flown in space to predict severe weather on Earth," Volz said. "The fantastically rich images provide us with our first glimpse of the impact GOES-16 will have on developing lifesaving forecasts." After its launch on Nov. 19 atop a United Launch Alliance Atlas V rocket, GOES-16 spent about two weeks getting to its final geostationary orbit about 22,300 miles (35,900 kilometers) above North America, near the equator. This type of orbit means that the satellite will always hover over the same part of the Earth, allowing it to continuously keep tabs on the weather. The satellite's new photos, which were taken by its Advanced Baseline Imager instrument, show portions of the Western Hemisphere at four times the image resolution as those taken by older GOES spacecraft, NOAA officials said in the statement. This allows weather forecasters to make more precise predictions not only for routine weather forecasts, but also for extreme weather events, like hurricanes and tornadoes. GOES-16 provides more than just a high-resolution view of the clouds and their movements; the satellite can also closely track lightning down to a resolution of about 6 miles (10 km). Although GOES-16 may be in a geostationary orbit, its distance from Earth allows it to catch a glimpse of Earth's moon. In fact, just like older GOES spacecraft, GOES-16 relies on the moon to calibrate its Earth-viewing instruments, according to NOAA.